this year, i'm focusing more on handmade Christmas gifts. 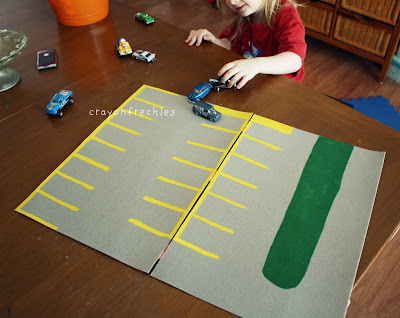 this wasn't a Christmas gift, but it's an idea for those of you with kiddos that love to play with cars. 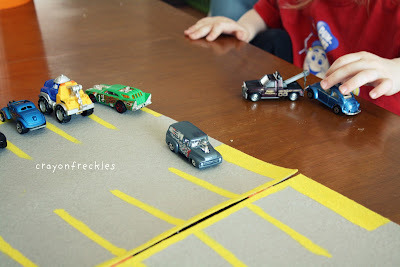 Bear was playing cars and lining them up on our dinner table. i asked him if he wanted me to make him a parking lot. of course he said yes, so we picked up the materials the next day. i used two stiff pieces of felt so that it wouldn't bend as easily. i fabric-glued three felt strips on the back to create the spine so it can fold in half. the most time consuming part was painting the lines on it. they aren't perfect. i had to do this quickly because he wanted to play with it later that night. he was ecstatic with it, so that's all that matters, right? i'd love it if you left a link for any homemade gifts you've made so i can check them out! I'm sure he had so much fun with it. We used to make things like that when Austin was much younger then we moved into large card board boxes for forts with dots and windows. So off subject, but your floors look fabulous! I will be posting some of my hand made gifts a bit later,, just in case some one is peeking! Looks like fun. Thanks for sharing at Bacon Time. Merry Christmas!